Go, a programming language developed at Google, has seen a lot of success in the last couple of years. A large portion of modern cloud, networking, and DevOps software is written in Go, for example Docker, Kubernetes, Terraform, etcd, or ist.io. Many companies are using it for general-purpose development as well. The capabilities that Go enables have allowed these projects to attract a large number of users, while Go's ease of use has enabled many contributions. Go's strengths come from combining simple and proven ideas while avoiding many of the problems found in other languages. This blog post outlines some of the design principles and engineering wisdom behind Go to show how – taken together – they qualify it as an excellent candidate to become the next large-scale software development platform. Many languages are stronger in individual areas, but no other language scores so consistently well when looking at all of them combined, especially in regards to large-scale software engineering. Go focuses on alleviating these large-scale engineering pains, sometimes at the cost of making engineering in the small a bit more cumbersome, for example by requiring a few extra lines of code here and there. Go emphasizes offloading as much work as possible to automated code maintenance tools. The Go toolchain provides the most frequently needed functionality like formatting code and imports, finding definitions and usages of symbols, simple refactorings, and identification of code smells. Thanks to standardized code formatting and a single idiomatic way of doing things, machine-generated code changes look very close to human-generated changes in Go and use similar patterns, allowing more seamless collaboration of humans and machines. Many people are surprised that Go doesn't contain concepts they love in other languages. Go is indeed a very small and simple language that contains only a minimal selection of orthogonal and proven concepts. This encourages developers to write the simplest possible code with the least amount of cognitive overhead so that many other people can understand and work with it. Good code is obvious, avoids cleverness, obscure language features, twisted control flow, and indirections. Many languages focus on making it efficient to write code. However, over the course of its lifetime, people will have spent far (100x) more time reading code than was needed to write it in the first place. Examples are to review, understand, debug, change, refactor, or reuse it. When looking at code, one typically only sees and understands small parts of it, often without a complete overview of the entire code base. To account for this, Go makes everything explicit. An example is error handling. It would be easier to just let exceptions interrupt code at various points and bubble up the call chain. Go requires to handle or return each error manually. This makes it explicit exactly where code can be interrupted and how errors are handled or wrapped. Overall, this makes error handling more cumbersome to write but easier to understand. Go is so small and simple that the entire language and its underlying concepts can be studied in just a couple of days. In our experience, after no more than a week of training (compared to months in other languages) Go beginners can make sense of code written by Go experts and contribute to it. To make it easy to ramp up large numbers of people, the Go website provides all the tutorials and in-depth articles needed. These tutorials run in the browser, allowing people to learn and play with Go before even installing it on their local machine. Go empowers teamwork over individual self-expression. Developers dismiss good working code as "messy" and demand to rewrite it before they can work on it because they don't think in the same way as the original author. Different team members write parts of the same code base in different subsets of the language. Go is designed for modern multi-core hardware. Because all compute primitives are provided in a direct form by the language, Go source code expresses what a server does more directly. Object-orientation is incredibly useful. The last decades of using it have been productive and given us insights about which parts of it scale better than others. Go takes a fresh approach at object-orientation with those learnings in mind. It keeps the good parts like encapsulation and message passing. Go avoids inheritance because it is now considered harmful and provides first-class support for composition instead. More background on this by Russ Cox. focus conversations on important topics: it eliminates a whole array of bike-shed debates around tabs vs spaces, indentation depth, line length, empty lines, placement of curly braces, and others. developers feel at home in each others code base because other code looks a lot like code they would have written. Everybody loves having the liberty to format code the way they prefer, but everybody hates it if others take the liberty to format code the way they prefer. automated code changes don't mess up the formatting of hand-written code, for example by introducing accidental whitespace changes. Long compilation times for large code bases was the drop in the bucket that sparked Go's genesis. Google uses mostly C++ and Java, which compile relatively quickly compared to more sophisticated languages like Haskell, Scala, or Rust. 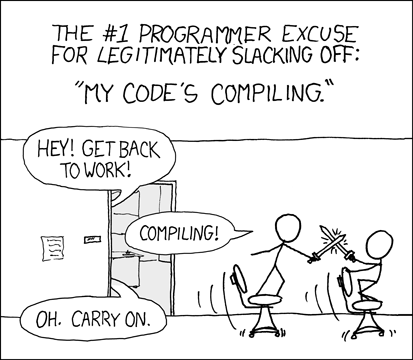 Still, when compiling large code bases even small amounts of slowness compound to infuriating and flow-disrupting compilation delays. Go is designed from the ground up to make compilation efficient and as a result its compiler is so fast that there are almost no compilation delays. This gives a Go developer instant feedback similar to scripting languages, with the added benefits of static type checking. Because the language runtime is so simple, it has been ported to many platforms like macOS, Linux, Windows, BSD, ARM, and more. Go can compile binaries for all these platforms out of the box. This makes deployment from a single machine easy. Runtimes like the JVM, Python, or Node don't just load your program code when running it. They also load large and highly complex pieces of infrastructure to compile and optimize your program each time you run it. This makes their startup time slower and causes them to use large amounts (hundreds of MB) of RAM. Go processes have less overhead because they are already fully compiled and optimized and just need to run. Go also stores data in very memory-efficient ways. This is important in cloud environments where memory is limited and expensive, as well as during development where we want to boot up an entire stack on a single machine quickly while leaving memory for other software. Go binaries are very concise in size. A Docker image for a Go application is often over 10x smaller than the equivalent written in Java or Node because it doesn't need to contain compilers, JITs, and requires less runtime infrastructure. This matters when deploying large applications. Imagine deploying a simple application onto 100 production servers. When using Node/JVM, our docker registry has to serve 100 docker images @ 200 MB = 20 GB in total. This will take some time to serve. Imagine we want to deploy 100 times a day. When using Go services, the Docker registry only has to serve 100 docker images @ 20 MB = 2 GB. Large Go applications can be deployed faster and more frequently, allowing important updates to reach production faster. Go applications are deployed as a single executable file that includes all dependencies. No JVM, Node, or Python runtime at a specific version needs to be installed. No libraries have to be downloaded onto production servers. No changes to the machine running the Go binary have to be made at all. It isn't even necessary to wrap Go binaries into Docker to share them. You just drop a Go binary onto a server and it will run there no matter what else is running on that server. The only exception to the above statement is dynamic linking against glibc when using the net and os/user packages. We can review, analyze, and test third-party code before using it. This code is as much a part of our application as our own code and should conform to the same quality, security, and reliability standards. No need for permanent access to the various locations that store dependencies. Get your third-party libraries from anywhere (including private Git repos) once and you have them forever. No further downloads of dependencies are necessary to compile the code base after checkout. No surprises if a code repository somewhere on the internet suddenly serves different code. The Go team promises that existing programs will continue to work on newer generations of the language. This makes it easy to upgrade even large projects to newer versions of the compiler and benefit from the many performance and security improvements they bring. At the same time, thanks to the fact that Go binaries include all the dependencies they need, it is possible to run binaries compiled with different versions of the Go compiler side by side on the same server machine, without the need for a complex setup of multiple versions of runtimes or virtualization. It is embedded in the source code so that both can be maintained at the same time. It requires no special syntax - documentation is just normal source code comments. Runnable unit tests are often the best form of documentation, so Go let's you embed them into the documentation. All the documentation utilities are built into the toolchain and therefore everybody uses them. The Go linter requires documentation for exported elements to prevent the build-up of "documentation debt". Some of the most popular and thoroughly engineered software happens when commercial entities develop in the open. This setup combines the strengths of commercial software development - consistency and polish to make a system robust, reliable, and performant - with the strengths of open development like widespread support across many industries, support from multiple large entities and many users, and long-term support even if commercial backing stops. Go is developed this way. Of course, Go is not perfect and there are always pros and cons with every technical choice. Here is a small selection of areas to consider before committing to Go. While Go's standard library is industry-leading in supporting many new concepts like HTTP 2 server push, third-party Go libraries for external APIs can be less mature compared to what exists for example in the JVM ecosystem. Knowing that it is almost impossible to change existing language elements, the Go team is careful to only add new features once they are fully developed. After an intentional phase of 10 years of stability, the Go team is contemplating a set of larger improvements to the language as part of the journey towards Go 2.0. While Go's garbage collector introduces only very short interruptions, supporting hard real-time requires technologies without garbage collection, like for example Rust. This blog post has given some background on the wise, but often not so obvious, choices that went into the design of Go and how they will save large engineering projects from many pains as their code bases and teams grow orders of magnitudes. Taken as a whole, they position Go as an excellent choice for large development projects looking for a modern programming language beyond Java. I am building and maintaining a culture of excellence, openness, fun, and productivity at Originate, while continuously advancing our engineering practices and processes.